We’ve been extremely lucky this year in regards to snow in our area. We had snow one morning a few weeks back, but it quickly melted. However, today the flurries are starting to come down again and it won’t be long before we’ll see the drifting snow on the ground. I love looking at the freshly fallen snow, but I cannot bear the cold it brings. 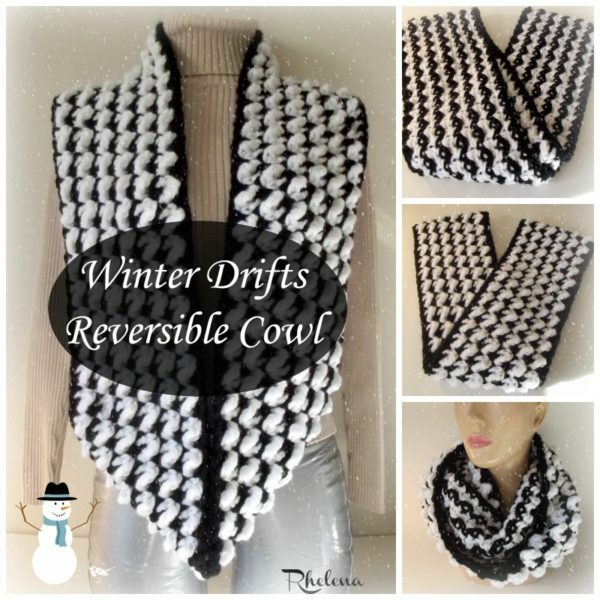 So it’s perfect timing for the winter drifts reversible cowl pattern. It’s a thick fabric to keep you warm in the cold and snowy winter weather. This cowl pattern looks great on both sides of the fabric. The one side has a nice texture, while the other side has a lovely color design. 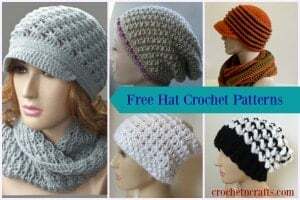 And although you could crochet this in a solid color, I highly recommend you use at least two colors in order to bring out the color work. Shown below is an image of the “wrong side”, which in my opinion is just as pretty as the ‘right side”. 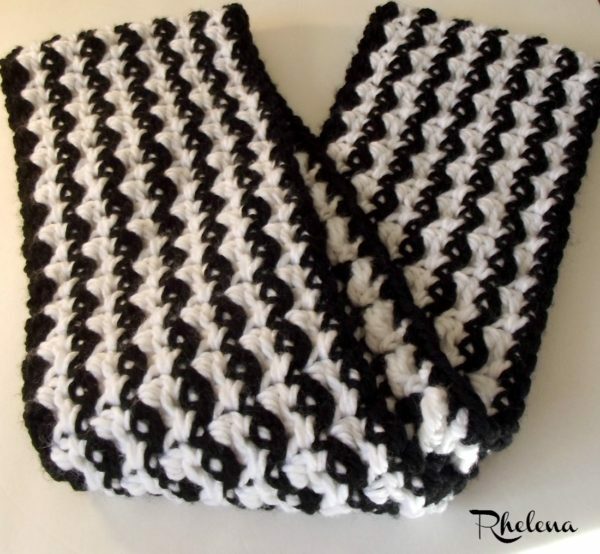 As with most of my designs, this cowl can be crocheted to any length and width that you like. Thus, there’s no reason why you couldn’t also crochet this in a worsted weight yarn. It would take a bit longer to crochet, but the finished cowl would be just as lovely. So I hope you’ll enjoy the pattern and keep warm! Yarn: Loops & Threads Charisma #5 – Two 3.5oz balls of CB and One 3.5oz ball of CA. Gauge: Measures approximately 3″ over 5 sts. Finished Size: 29.5 by 6.5 inches, but can be adjusted as needed. Join new color in joining sl st of rnd. Do not fasten off, but carry the unused yarn up at each rnd. Pattern is easy to adjust in size, so feel free to experiment with any yarn and hook sizes. With CA, Ch 100 (or any multiple of 2), join with sl st in first ch being careful not to twist chs. Rnds 4-13: Rep rnds 2-3 until you have reached a desired width. Fasten Off at last rnd. Thank you so much to Melissa Wells of TangledNot and Alexandra Richards of EyeLoveKnots for Testing this for me.